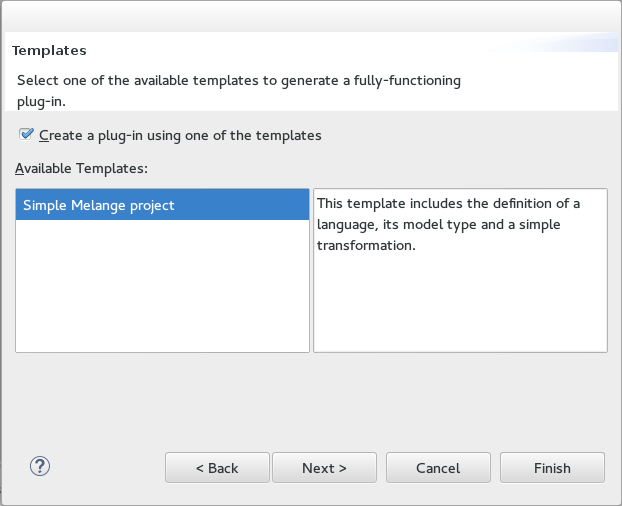 This tutorial assumes you have installed Melange following the installation instructions. One of the core features of Melange is the support for executable metamodeling. Using Melange, one can define the syntax and semantics of her language (for example, using an interpreter). 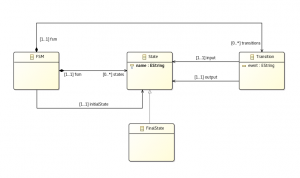 In this tutorial, we define a simple language for finite-state machine (FSM) modeling. We detail how to create the syntax of our FSM language, its semantics, and how to execute the models conforming to it. 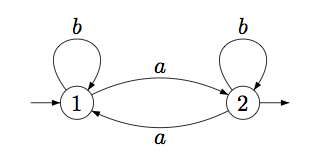 A FSM is conceived as an abstract machine that can be in one of a finite number of states. The machine is in only one state at a time; the state it is in at any given time is called the current state. It can change from one state to another when initiated by a triggering event or condition; this is called a transition. A particular FSM is defined by a list of its states, and the triggering condition for each transition. 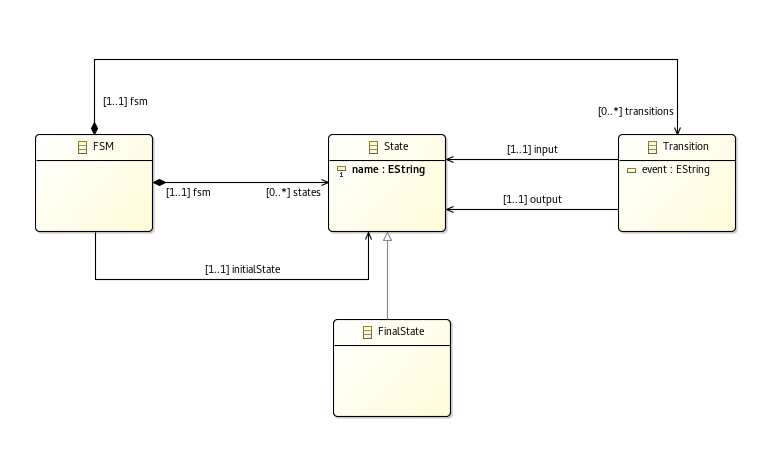 Eclipse Modeling Framework > Empty EMF Project > Next > Name: “fr.inria.diverse.minifsm” > Finish. The new Ecore file contains a package with no name. Properties of the class (such as its name) can be edited using the Properties view. 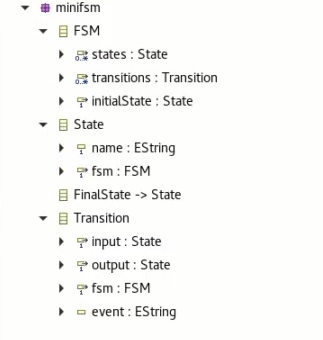 To define the operational semantics of the FSM language, we implement an interpreter for it. In this section, we use the K3 meta-language for that purpose. Create a new file “minifsmAspects.xtend” in this package and open it. The @Aspect annotation takes as argument a className which specifies the class of the metamodel to re-open (think about it as the aspect “pointcut”). All the features of the class annotated with @Aspect are woven on the target class of the metamodel using static introduction: this is the aspect’s advice. In this example, a new method checking if a given transition is fireable is inserted. The @Aspect defines a new implicit variable named _self which references the base class (Transition in this case). We have a project defining the domain model and another defining its interpreter. We will now define a Melange Language to assemble theses two concerns in one entity. 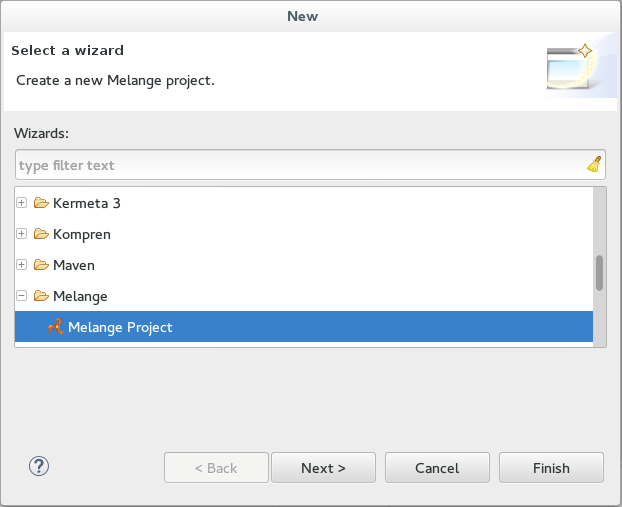 Open the menu File > New > Project... and select Melange > Melange Project, then click Next. Name the project “fr.inria.diverse.melange.fsm” and click Next. Check Create a plug-in using one of the templates and select Simple Melange project, then Next. Set “fr.inria.diverse.melanger” as package, and change language name to MiniFSM. Browse the location to select minifsm.ecore from the “fr.inria.diverse.minifsm” project, then Finish. fr.inria.diverse.minifsm should be already there thanks to the wizard. This step is needed to have both metamodel and interpreter projects in the classpath of the Melange project. If you look at the outline at the right side, you can see the language typed by its own ‘exactType’. Each language is defined by an .ecore file but remember we added behaviors with Aspects. So we have to put them also in the languages declaration. 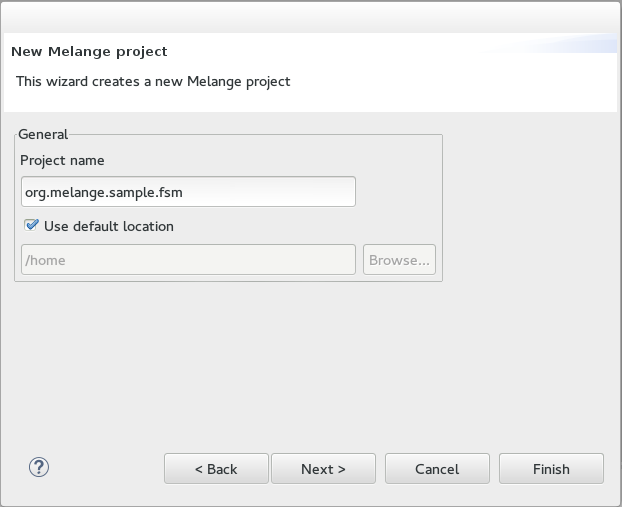 Do a right click on the .melange file and select Melange > Language Runtime. 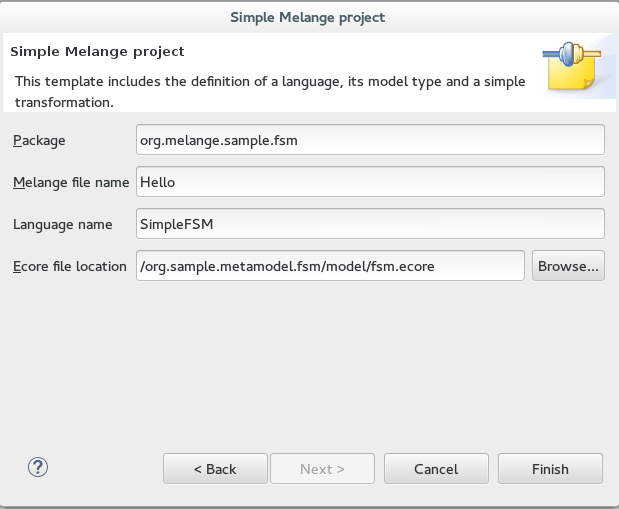 The new created project contains the metamodel and the aspects declared in the .melange file. They are simple copies from the domain model project and the Kermeta project but you can note that the nsURI of the metamodel and packages of the aspects are differents. Now we will test if the MiniFSM works fine. To do so, we will declare a transformation that will load a MiniFSM model an execute it. In Melange we can declare several transformations. To set one of them the entry point we tag it with @Main. We get the first element of the model and cast it to the right type. minifsm.minifsmmt is the package containning all classes of the exactType of the MiniFSM language. To launch the main(), look inside the folder src-gen (where Melange generates Java files) and inside the package minifsm, right click on Main.java and select Run As > Java Application.